(The Source) – That it had come to such an ignominious end for Robert Mugabe should not be a surprise to anyone. He was a man used to getting his way. for his leadership disappeared overnight. Even the acerbic leader of ZANU-PF’s youth leader, Kudzanai Chipanga, performed a spectacular about turn, blaming his puerile age for his naivety. George Charamba, apparently unconcerned about the unfolding drama. jolted him to reality, as should have that of Simon Khaya Moyo, who only a few days earlier was leading the condemnation of the military action as treasonable. He probably knew the game was up when only five members of his rather extravagantly large Cabinet turned up for a weekly meeting none would dare miss in the bygone era. 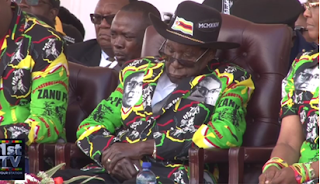 Mugabe had become a leper that had to be confined to the dustbin of history. His former allies could not get rid of him fast enough. Still he resisted any move to force him out of office. Sources speak of the difficulties faced by negotiators trying to persuade him to leave of his own volition. They speak of a man living in his own world, who believed that he remained the Dear Leader of old, and that the demonstrations and noises from his party were a passing phase. He has ridden out crises before, he likely reasoned. Just as he had when he foisted the curse of bond notes upon Zimbabweans in November last year. The public would eventually get over their initial resistance to bond notes and accept them, he reasoned then. So he sat tight and hoped against hope as opponents closed one door after another in his face. death squads on civilians of a different political persuasion. Opponents also say he had become a master at rigging elections, with little understanding of managing an economy. In the early years of his rulership, Mugabe was the darling of the people, overseeing a huge expansion in the country’s health system and the education sector. At the end of his reign, he had driven his country into economic ruin. Millions of Zimbabweans fled the country to seek opportunities elsewhere. About 90 percent of Zimbabwe’s adult population is unemployed and the country’s graduates have been reduced to vendors. For such a consummate political operator, his undoing was his young wife’s political ambitions. ZANU-PF’s charge sheet against him was dominated by ‘crimes’ committed by Grace Mugabe with his tacit blessing. Gucci Grace, as Zimbabweans have christened her for her reported expensive taste, hijacked her husband’s presidency and led a purge of perceived enemies that left the ruling ZANU-PF party deeply divided. She waltzed onto the political scene, held rallies countrywide where she railed and ranted, claiming the scalp of Mugabe’s then deputy, Joice Mujuru. In 2014, she was made head of the ZANU-PF women’s league and soon turned her guns on Mnangagwa, who had replaced Mujuru. On November 6, Mugabe obliged her and fired Mnangagwa. One week later, the military took over and Zimbabweans took to the streets, writing a final, perhaps fitting epitaph into an African strongman’s political career. By end of day, ZANU-PF announced that Mnangagwa will assume office within 48 hours and serve out the remainder of Mugabe’s term. The old Mugabe was a wily, calculating political operator. The man who finally quit on Tuesday, three months before his 94th birthday as his former comrades were twisting the knife in his back, was a lost and desperately sad man.